1. Wash and dry apples, then remove the stem. It’s a good idea to start a “pilot” hole for the apple stick before dipping or wrapping the apples to ensure that it will enter easily and stand straight; this can be done with a large skewer or a chopstick. 2. Dip or wrap each apple in caramel, according to manufacturer’s instructions; insert a lollipop or popcicle stick into each. 3. Prepare a receiving pan or cookie sheet by lining with parchment or wax paper, then melt chocolate ganache or dipping chocolate. 4. Dip caramel apples in chocolate, and let rest on receiving pan for 10 minutes. 5. Additional piping can be added—scrolls, small beads, or a design of your choosing—using fudge or ganache with a #3 plain round tip. 6. Once the chocolate on the apples has cooled, the apples can be dipped in Dark Chocolate sprinkles or Autumn Mix sprinkles. 8. If desired, add a bow to the top of the stick for added flair. Ultimate Caramel Apples from www.cookingclassy.com – I love how she used twigs instead of boring popsicle sticks! Super cute! Triple Dipped S’mores Apples from www.countryliving.com – Marshmallows, chocolate, and graham crackers, yum! 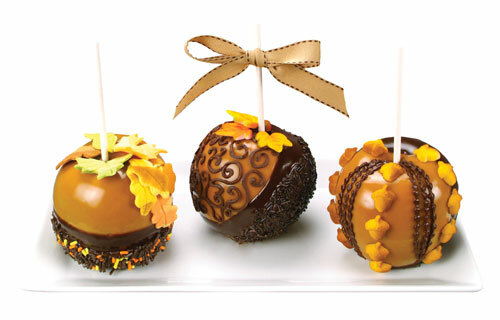 Gourmet Caramel Apples from www.tasteofhome.com – These fall apple treats look soooo delicious and pretty too! Love the use of orange striped straws! This entry was posted in Autumn Baking Ideas, Halloween Baking, Instructions & How-To's, Recipes & Tips and tagged caramel apples, gourmet caramel apples by Fancy Flours. Bookmark the permalink.